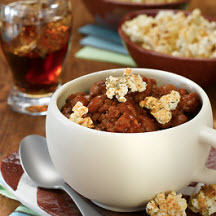 This unique popcorn chili and soup topper is also makes a great snack, too! Place popcorn in a large, clean paper bag. Spray popcorn lightly with cooking spray, about 5 quick sprays. Sprinkle on chili or soup at serving time. Recipe and photograph courtesy of The Popcorn Board.